The Wattle Range Council district has long been home to many talented, passionate and skilful young people who want to make a positive difference in their communities. And now, as part of the National Youth Week 2016, the Wattle Range Council has opened their Youth Recognition Award for nominations. Wattle Range Council Community Development Officer Sarah Marzec said the council recognises the important and valuable contribution youth make to the community. “To acknowledge this contribution we invite youth from 12-18 years to nominate and be a part of the awards process,” Sarah said. This award recognises an individual who has made a positive contribution to the community, has volunteered their time to help others and/or is an active member of the community (such as volunteering with community groups or their school). Recognising an individual has assisted tirelessly a family or friend in need. Recognises an individual who works to continually improve themselves or assists others in learning outcomes. Recognises an individual who has used innovation and ideas that have been recognised by peers. Recognises an individual who has turned a negative situation into a positive. They have had the courage to get through a bad situation and show great resilience and determination. This person is someone who inspires others. A presentation night will be held at 6-8pm on Monday, April 11 in the Millicent Civic and Arts Centre and prizes on the night include a certificate and a monitory award for each category winner, as well as promotional bag. The nomination forms can be completed online at the council’s website. Categories: Community Groups, Local Government | Permalink. Council released the following statement today regarding the Strategic Community Plan – urging the community to have their say. ‘As part of the development of the Wattle Range Council’s “2020 Vision” Strategic Community Plan, residents are invited to have input in the future of their community through a recently released community survey.The survey encourages participants to share their thoughts on how Council should improve its services and facilities, as well as ideas and suggestions to develop the region and plan for the future. It covers issues such as Council’s current services and infrastructure, strengths and weaknesses, communication and consultation with the community and future initiatives for youth and aged services. Mayor Peter Gandolfi encouraged all residents to take the time to complete the survey. “It is important for everyone to have an opportunity to have their say,” he said. “Council wants to keep in touch with the aspirations of its local residents and determine their priorities so that Council can make the best decisions possible on behalf of its community. When finalised, the 2020 Vision document will set out what Council aims to achieve over the next four year period and gives directions and targets in the future management of our region. This plan, will act as the blueprint for Council’s operations, and guides its annual financial and operational programming, ensuring that Council’s resources are used efficiently to deliver initiatives and projects that are important to the Wattle Range community. Council requests that its residents and ratepayers complete the community survey by Friday, 26 February 2016. It is available to complete online at www.wattlerange.sa.gov.au or a hard copy is available from one of Council’s Offices, Visitor Information Centres or the Millicent Library. Council will also host a community consultation forum providing further opportunity for comment, the date of which will be advertised early in March. Categories: Local Government | Permalink. 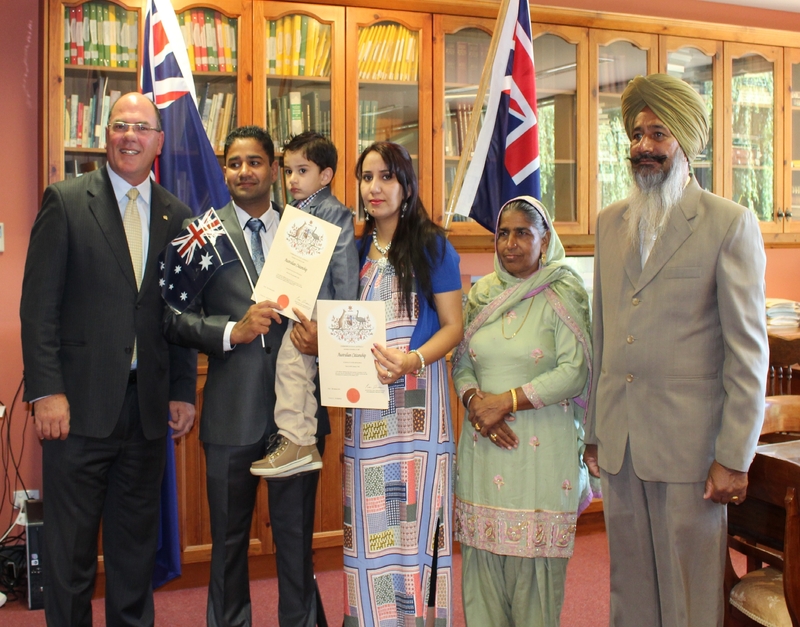 Above is a photograph of Mayor Gandolfi presenting the Dhaliwal family, Sukhchain, Kamaljit and their son Surkhab with their Australian Citizenship certificates at a ceremony held in the Millicent Library History Room on Friday, 8 January 2016. The Dhaliwal family reside in Millicent and are originally from India. The young family opened the popular New Heaven Indian Restaurant in Millicent 2 years ago winning the MBCA Outstanding Business Awards 2 successive years and have just opened a second one in Mt Gambier. 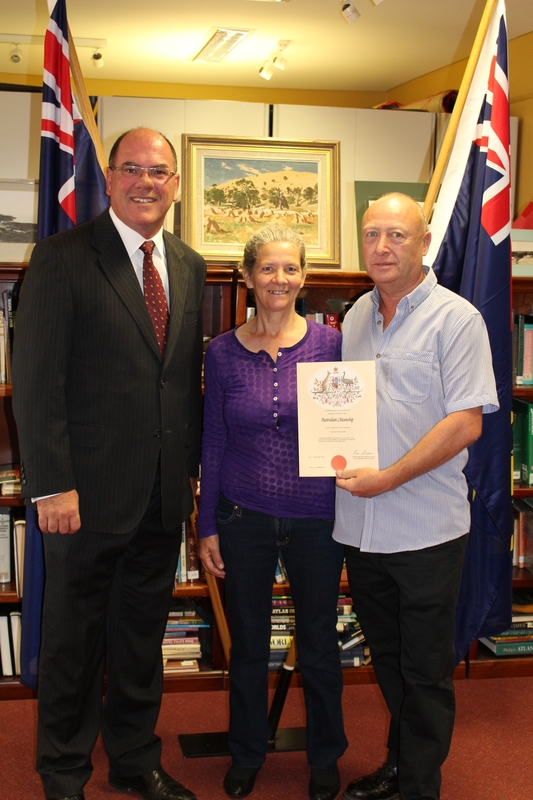 Mayor Gandolfi presenting Mr John Cosgrove with his Australian Citizenship certificate at a ceremony held in the Millicent Library History Room on Thursday, 14 January 2016. John, originally from the United Kingdom, now lives in Tantanoola. He was joined at his ceremony by his wife Cath. Categories: Local Government, Millicent | Permalink.